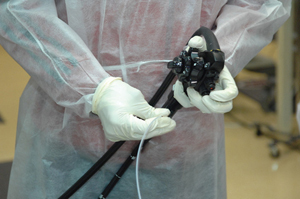 Endoscopic retrograde cholangiopancreatography, or ERCP, is a specialized technique used to study the ducts of the gallbladder, pancreas and liver. Ducts are drainage routes; the drainage channels from the liver are called bile or biliary ducts. 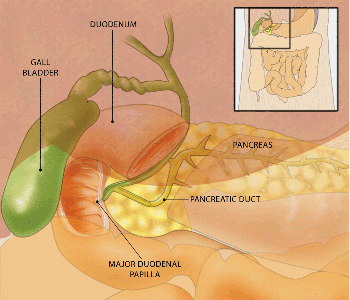 The pancreatic duct is the drainage route from the pancreas. Endoscopic retrograde cholangio-pancreatography, or ERCP, is a specialized technique used to study the bile ducts, pancreatic duct and gallbladder. Ducts are drainage routes; the drainage channels from the liver are called bile or biliary ducts. The pancreatic duct is the drainage channel from the pancreas. During ERCP, your doctor will pass an endoscope through your mouth, esophagus and stomach into the duodenum (first part of the small intestine). An endoscope is a thin, flexible tube that lets your doctor see inside your bowels. After your doctor sees the common opening to the ducts from the liver and pancreas, called the major duodenal papilla, your doctor will pass a narrow plastic tube called a catheter through the endoscope and into the ducts. Your doctor will inject a contrast material (dye) into the pancreatic or biliary ducts and will take X-rays. An endoscope is a thin, flexible tube that lets your doctor see inside your digestive tract. During ERCP, your doctor will pass an endoscope through your mouth, esophagus and stomach into the first part of the small intestine. You should fast for at least six hours (and preferably overnight) before the procedure to make sure you have an empty stomach, which is necessary for the best examination. Your doctor will give you precise instructions about how to prepare. You should talk to your doctor about medications you take regularly and any allergies you have to medications or to intravenous contrast material (dye). Although an allergy doesn't prevent you from having ERCP, it's important to discuss it with your doctor prior to the procedure, as you may require specific allergy medications before the ERCP. Inform your doctor about medications you're taking, particularly aspirin products, arthritis medications, anticoagulants (blood thinners, such as warfarin or heparin), clopidogrel or insulin. Also, be sure to tell your doctor if you have heart or lung conditions or other major diseases which might prevent or impact the decision to conduct endoscopy. ERCP is sometimes used to make a diagnosis of chronic pancreatitis. What can I expect during ERCP? Your doctor might apply a local anesthetic to your throat and/or give you a sedative to make you more comfortable. Your doctor might even ask an anesthesiologist to administer sedation if your procedure is complex or lengthy. Some patients also receive antibiotics before the procedure. You will lie on your abdomen on an X-ray table. The instrument does not interfere with breathing, but you might feel a bloating sensation because of the air introduced through the instrument. ERCP is the most appropriate procedure to remove stones from the bile duct. 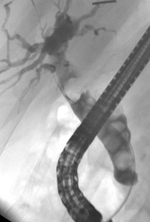 On this X-ray, there are multiple stones lodged in the bile duct. What are possible complications of ERCP? ERCP is a well-tolerated procedure when performed by doctors who are specially trained and experienced in the technique. Although complications requiring hospitalization can occur, they are uncommon. Complications can include pancreatitis (inflammation of the pancreas), infections, bowel perforation and bleeding. Some patients can have an adverse reaction to the sedative used. Sometimes the procedure cannot be completed for technical reasons. Risks vary, depending on why the test is performed, what is found during the procedure, what therapeutic intervention is undertaken and whether a patient has major medical problems. 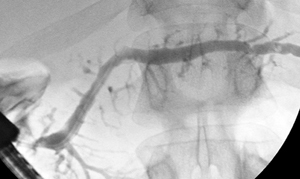 Patients undergoing therapeutic ERCP, such as for stone removal, face a higher risk of complications than patients undergoing diagnostic ERCP. Your doctor will discuss your likelihood of complications with you before you undergo the test. 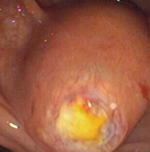 A large bile duct stone is impacted at the major duodenal papilla causing obstruction and severe infection of the bile duct. In this case, ERCP is urgently required to relieve the obstruction. What can I expect after ERCP? If you have ERCP as an outpatient, you will be observed for complications until most of the effects of the medications have worn off before being sent home. You might experience bloating or pass gas because of the air introduced during the examination. You can resume your usual diet unless you are instructed otherwise. Someone must accompany you home from the procedure because of the sedatives used during the examination. Even if you feel alert after the procedure, the sedatives can affect your judgment and reflexes for the rest of the day.